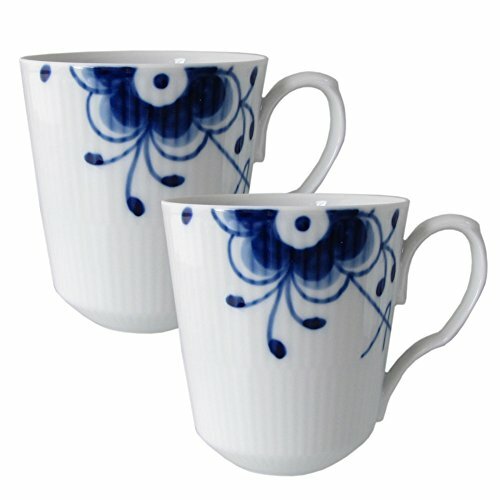 View More In Cups, Mugs & Saucers - Page 9. 2381043 Features: -Blue Fluted Mega collection. -Hand painted. Product Type: -Coffee mug. Color: -White; Blue. Material: -Porcelain. Number of Items Included: -2. Style: -Scandinavian. Pattern: -Floral. Dimensions: Overall Product Weight: -1.48 lbs. Cup/Mug Height - Top to Bottom: -8.07". Cup/Mug Width - Side to Side: -5.7". Cup/Mug Depth - Front to Back: -4.2".